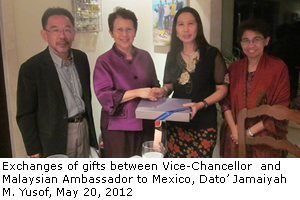 MEXICO CITY, 21 May 2012 – The National University of Malaysia (UKM) has expanded its cooperation with El Colegio de Mexico (COLMEX) which began in 2007 to pursue a more vigorous research collaboration while also initiating a postdoctoral programme. This follows the signing of a Memorandum of Understanding (MOU) by its Vice-Chancellor, Prof Tan Sri Sharifah Hapsah Syed Hasan Shahabuddin and COLMEX Secretary, Dr. Manuel Ordorica Mellado here today. Prof Sharifah Hapsah described the signing as a very significant event as “Mexico is the bridge and the main door to Latin America”. The MOU with COLMEX is the third that UKM signed in Latin America. 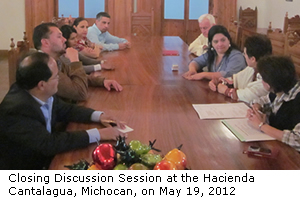 The first two MOUs were signed in 2011, with Universidad Interculturales Estados Unidos (UIEM) of Mexico and Universidad Nasional of Costa Rica. She said UKM was privileged to partner with COLMEX. “We are 32 years younger, having just celebrated our 42nd anniversary two days ago on May 18”. She emphasized that as UKM is The National University of Malaysia built on the aspirations of the indigenous Malay communities of Malaysia, “we believe it is our duty as the national university to promote national identity and culture even while we are internationalizing”. Prof Sharifah Hpsah said: “Mexico is an important country for us and especially for UKM, being The National University, we find Mexico a fascinating country with which to forge strong academic links”. She said Malaysia and Mexico share the rich diversity of their indigenous populations and have much to learn from each other in intercultural understanding among the youths participating in their collaborative programmes. She hoped that COLMEX students would join the UKM-Global Student Mobility Partnership which aims at “Building Bridges for International Understanding and Friendship” soon. The partnership allows students to participate in a 3 week programme covering either Indigenous Communities of Malaysia or Sustainable Tropical Heritage. This year’s programme will begin on June 28, she said. UKM is also pursuing two other important activities, the translation of the Compact History of Mexico, a book published by COLMEX and the possible participation of COLMEX members in The Third International Seminar of Latin American Studies in Asia (LASA 3) which will be held at the end of the year. More importantly, Prof Hapsah said, Mexico is the centre of a rich and proud cultural heritage embodied in the traditions of excellent academic pursuit among its scholars and the people of Mexico in general, she said. The scholarship among the Mexican people can be traced back to the traditions and culture of the great pre-Hispanic civilizations. These great traditions and multiple epistemologies continue to be practiced to this day. She said, academically, Mexico must also be proud to have produced three Nobel Laureates: Alfonso Garcia Robles who received the Nobel Peace prize in 1982, Octavio Paz, the Nobel Prize for Literature in 1990 and Mario Jose Molina Henrique who was awarded the prize for Chemistry in 1995. “We also share your pride in Sor Juana Ines de la Cruz, who wrote what is now known as the first feminist manifesto fighting for the women’s right to education in the 17th century. “In the last century, the artistic work of Frida Kahlo provides inspiration for the present and future generation. Such rich heritage should be studied and appreciated by all,” Prof Sharifah Hapsah said. COLMEX is built on the premise of promoting a great academic culture. The reputation of the university for research and learning is recognised worldwide. For twenty years since 1940, COLMEX grew steadily under the leadership of Prof Alfonso Reyes, its founding President. Since 1976, when the university moved to this beautiful campus, COLMEX has expanded its academic programmes into the present seven important study centers, covering the disciplines of History, Language and Literature, International Studies, Asia and Africa, Economics, Science and Technology, Demography, Reproductive Health and Population, and Women she said. “The prestige of your programmes is reflected in the establishment of a number of distinguished Chairs, notable among them, The Raul Prebisch Chair, The Simone de Beauvoir Chair and the Daniel Cosio Villegas Chair for the study of History,” Prof Sharifah Hapsah said. Present at the signing ceremony were The Malaysian Ambassador to Mexico, Dato’ Jamaiyah M Yusof; the Special Cultural Attache of the Mexican Embassy in Malaysia, Dra. Blanca Barrangan S. Monteczuma; Director of the Asian and African Studies COLMEX, Prof. Dr. Benjamin Preciado; Director of Office of International Relations, UKM, Prof Imran Ho Abdullah and Director of Institute of Occidental Studies (IKON), Assoc Prof Dr Rashila Ramli. The signing of the MOU is part of the activities of a 12 day visit by seperate UKM delegations to six universities in Mexico and Costa Rica discussing their future cooperations. The universities are Universidad Nasional Costa Rica, El Colegio de Mexico (COLMEX), Universidad Interculturales Estados Unidos (UIEM), Universidad Ibero Americana (IBERO), Centro Investigasiones Desarrollo Economica (CIDE) and Universidad Autonomos Nacional de Mexico (UNAM). The delegation apart from Prof Sharifah Hapsah include the Director of Institute of Ethnic Studies, Distinguished Prof Datuk Dr Shamsul Amri Baharuddiin; Director of Institute of Occidental Studies, Assoc Prof Dr Rashila Ramli; Director of International Relations Office, Prof Dr Imran Ho Abdullah and Dr Mohammad Sabri Haron, of the General Studies Centre (Pusat Pengajian Umum).